Email Verification Software To Help You Clean and Validate Your E-mail Address Lists. Validate e-mail address lists, removing duplicates and invalid or expired addresses. Test e-mail addresses at three verification levels – Syntax, DNS and SMTP. Import e-mail addresses from Text Files, Microsoft Word documents, Microsoft Excel spreadsheets,Outlook address books, and ANY ODBC-compliant database system. Save e-mail verification results to Microsoft Access, Microsoft Excel, SQL Server, Text Files and Word Files. Create your own rules using pattern-matching to fine-tune verification. Learn the probable country of origin for each address. 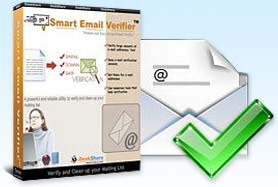 Smart Email Verifier has saved a lot of my time and from receiving bounced e-mails by deleting the bad e-mail addresses from my mailing lists.